Halo Vintage Round Diamond Engagement Ring in 14k Rose Gold | Shane Co.
A design worthy of taking note is this halo engagement ring. 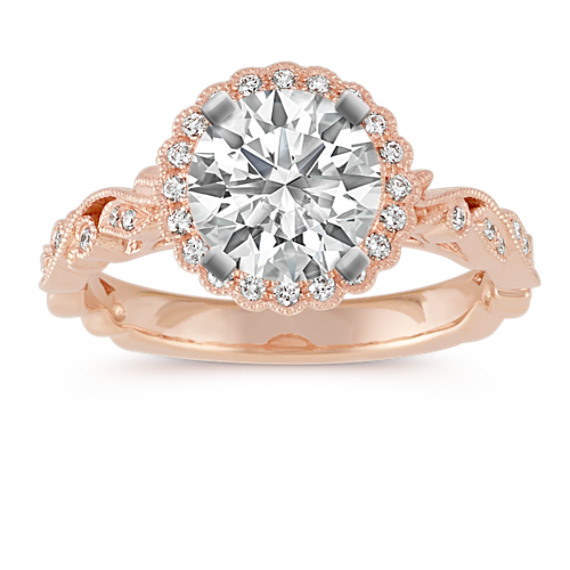 Thirty-two round diamonds, at approximately .14 carat total weight, are crafted in quality 14 karat rose gold adding a glimmer of sparkle throughout the setting. Within the round halo is a unique, vintage frame design complete with intricate milgrain detailing. Your choice of a .75 carat round diamond would complete this gorgeous look. The ring is 10mm wide at the halo and 2.5mm at the band. In LOVE with this beautiful ring!! !